The degree audit will note if a requirement has or has not been fulfilled. This is a useful tool to track degree progress and plan for future terms. In addition to using the degree audit, students are encouraged to regularly meet with their academic advisors. The degree audit is not a substitute for advising. How do I run a what-if degree audit? If you are looking to change your major or minor, you can run a “what-if” degree audit. See Step 4 of the degree audit instructions to run a “what-if” audit. What if no program is assigned to me? 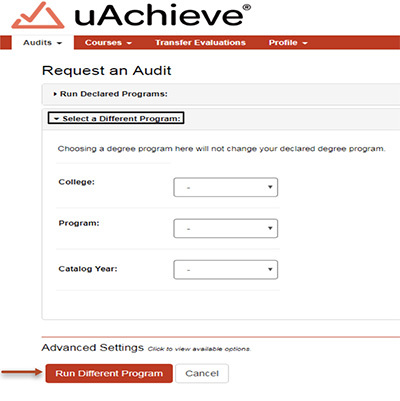 If you do not have a program readily available on the degree audit, you will need to contact your academic advisor and have the program officially assigned. In the meantime, you can run a “what-if” degree audit to see the requirements of the degree you wish to pursue. My major/minor in the degree audit is wrong. How do I change it? If you do not see the correct programs listed in your degree audit, please contact your academic advisor to correct this. The requirements for my major have changed and the degree audit is showing the old requirements? 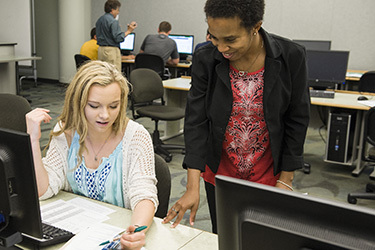 Students follow programs based on the term they were admitted to Wright State University. 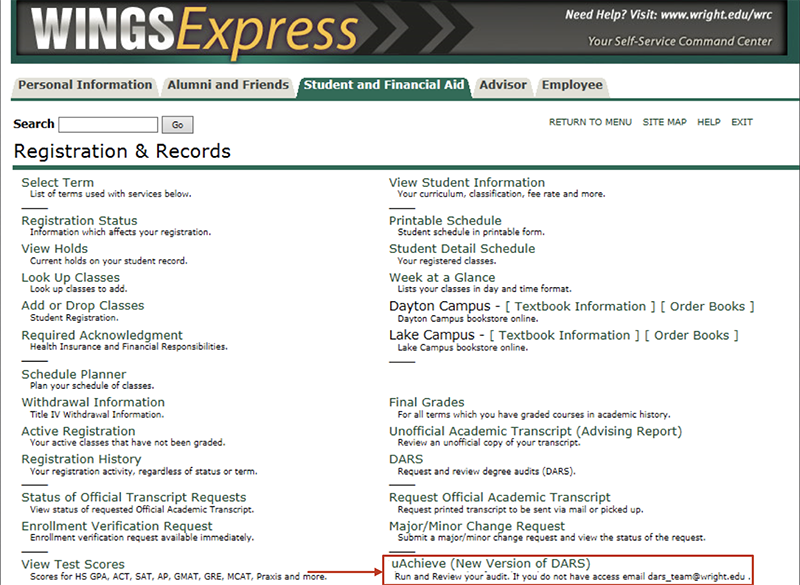 If you would like to update your catalog to the new requirements, you may contact your advisor and ask to be updated. If you have any questions about your degree audit or feel that something is incorrect on the degree audit, please contact your academic advisor. if an audit has been run in the past week, you will need to run a new audit. Press the Audits Tab and select Request New or press the red “Request Audit” button. Use the dropdown menus to select your desired college, program, and catalog year. You can also find minors and certificates to run through “What-if” audits. The audit is processing and may refresh several times before the audit finishes. Note: If you have several programs assigned to you, all of the programs will run simultaneously. Be sure to select the “View Audit” next to the one you wish to view. Each chart and graph is interactive. By selecting a chart, you can see which courses are applying to each area of your degree. The GPA box on the right-hand side is not used. The Cumulative GPA Column does not include transfer coursework. These icons help to indicate completion and progress of requirements and sub-requirements on the audit. If you have questions about any of these icons or codes, please speak with your academic advisor. 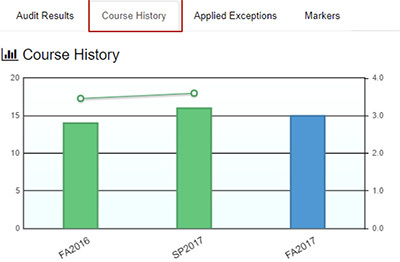 When a requirement is listed as “In Progress,” it indicates that if you pass the courses in which you register, then that requirement or sub-requirement will be complete. An “In Progress” requirement is denoted by a blue box with three dots in it. 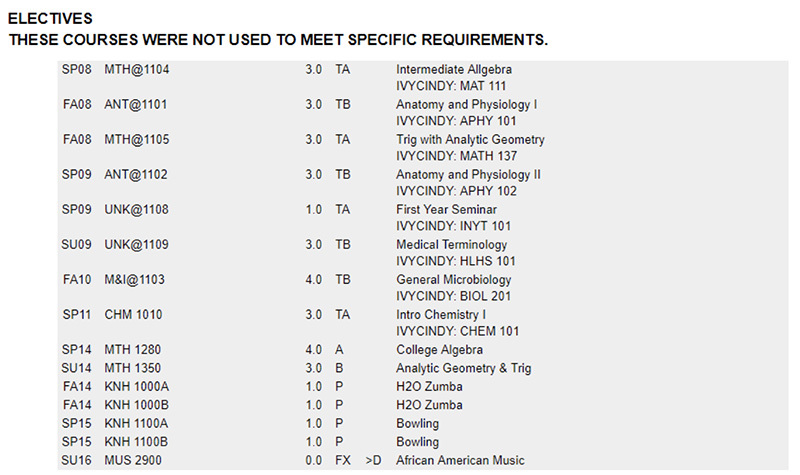 You can see which courses are the “In Progress” courses by viewing the courses with IP next to them. A grade of RG indicates that you are registered for the course. A real grade will replace this once you complete the course. Missing coursework? Courses that do not match anywhere will appear at the bottom of the audit. You can click on each column on the graph to see a list of courses completed during the selected term. By hovering your cursor over the circle above the column, you can find your term GPA for the selected term. 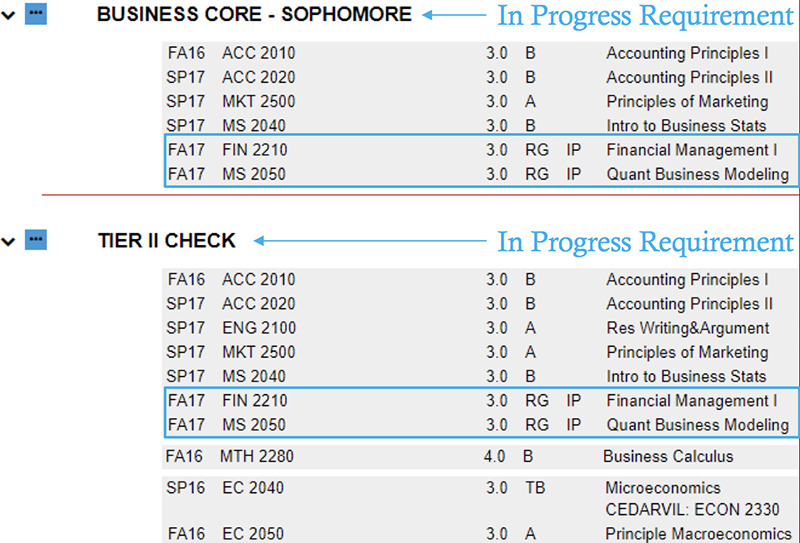 The blue column lists your current in-progress coursework and therefore does not display a GPA. Transfer courses are not displayed on this chart, but will be displayed below the graph in the Course History List. Press the “Transfer Evaluations” button to view your transfer credit. The transfer evaluation list shows the name of the school from which you transferred. 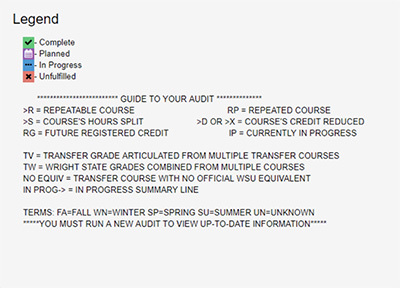 It then lists the courses you took at the previous institution and how it transferred to WSU. 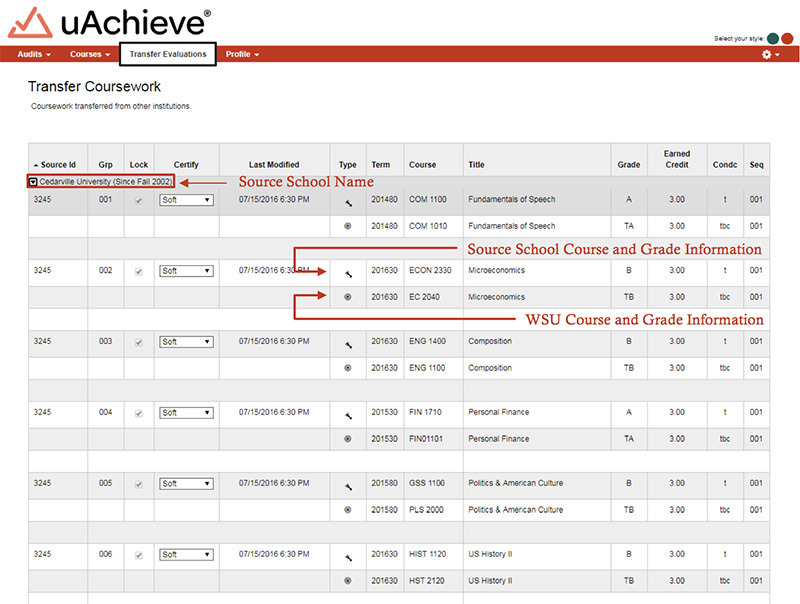 WSU does not post failing grades, developmental coursework, or non-academic religious coursework. These will not appear on your evaluation. By selecting the Applied Exceptions tab, you can view exceptions that have been made on your audit by your advisor. Think of exceptions as alterations: you may not understand what each one means, but you can always ask your advisor for help to better understand your audit. By selecting the courses displayed on the audit, you can view a course description. The course description window also provides additional information about the course, such as whether it is a lecture or lab, any restrictions, and credit hours. 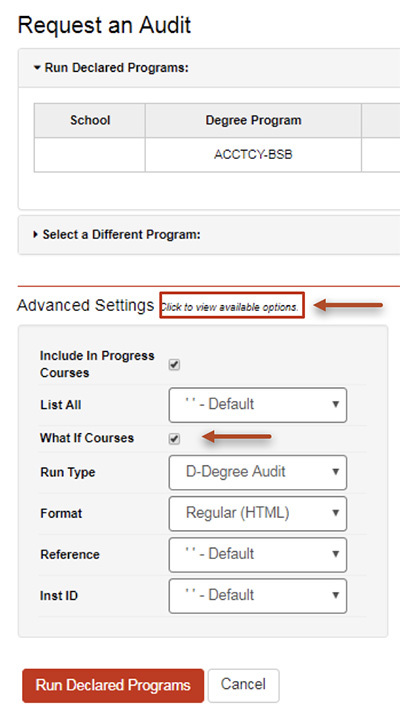 You can also add a course as a Planned Course by selecting the red “Add” button. See the next slide for help adding planned courses. 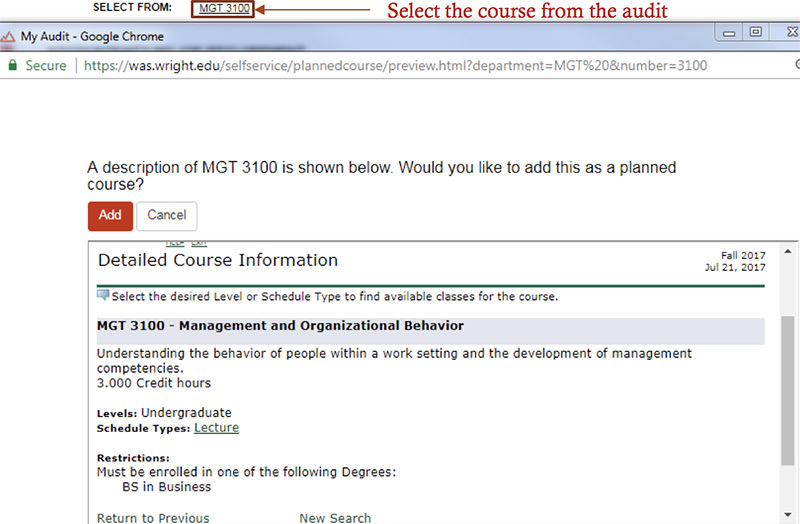 You can type in the information in the course, Rcredit, Grade, and Title areas. You can also select the term you plan to take a course. You can experiment with different grades to determine what grades you need to earn to meet a specific GPA. However, this may appear on your audit and be misleading. You should always switch the grades to PL once you have calculated your future GPA. Request a new audit by selecting the Audits Tab and pressing Request New. Select the “click here to view available options” button next to Advanced Setting. This will generate an audit so you can see your planned courses. Planned Courses appear in Purple and Requirements will have a PL next to them. Once you have thoroughly reviewed your audit, you can close your browser to exit the degree audit.